Check what the world is listening to. Don't miss a single move from your favorite artists, tracks and albums. Check out the daily and weekly Spotify charts. Updated everyday, these charts will give you an insight of what people are the most listening to in each country or globally in the world. The viral charts will also give you an insight of the most shared tracks, the potential next charts toppers. Ever wondered if a track is going up or down? If a track had a slow or a quick ascension of the charts? If the number of daily streams is growing? We have the answer with our detailed progression graphs. For each track, you can see the progression and number of streams in a particular country or globally. Your dashboard will show you everyday all the info you need related your favorite artists, tracks and albums. 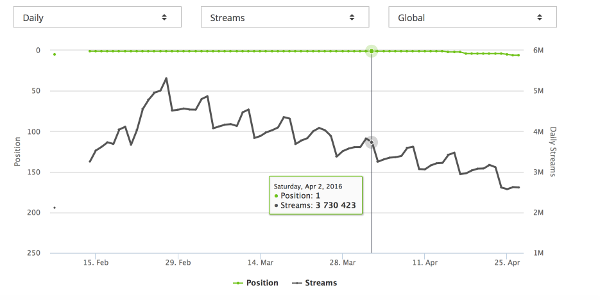 You won't miss any position in the Spotify charts anymore. You can also customize your dashboard if you are only interested in a few charts types or specific countries. The dashboard is all yours! And finally, you can receive all this by email everyday as soon as the charts are released so you don't miss anything. Being in popular playlists is one key factor for your tracks to be a sucess. Thanks to Spot On Track you will be able to monitor the playlists your tracks are in, at which position and how many followers these playlists have. Feel free to compare the playlists you are in, and the playlists your competitors are in. This can help you target the right playlists and take a huge step to the top of the charts. Spot On Track is a fantastic tool to monitor how our music is doing on Spotify, daily refreshed with all the new info we need at Universal. The new feature of playlist and viral chart overviews are very handy & helpful. We’ve recently started using Spot On Track and have to say we’re pleasantly surprised! We naturally always had our own methods of keeping track of our releases, but this system made the process a whole lot easier and gives a great and convenient overview! Spot On Track is a very useful tool from a bookers perspective, as it gives you detailed insight in the popularity of a track in certain countries. That way, it's easier to target on those countries and be more effective as booker. Spot On Track is a wonderful tool to keep track of how your released music is doing on Spotify, daily refreshed with all the new info you need as a manager, booker or label manager. Especially the new playlists & the viral charts overviews give info you would've searched for for hours otherswise, in a couple of seconds. Spot On Track is spot on when it comes to provide you with information about where the music of your artists is being played and analyses the growth in all the available markets. This helps us to clearly understand the evolution of any given release and really work on the territories as things are happening. I need this all day. Everyday!